You have my email Bob. I can put you in touch with someone who has used Leifs TSI reconstruction in a simulated electronic/electrical model & got a graph similar to the stated temp increases. Oops. Don’t know why I put Bob there. Senior moment perhaps. Thanks Dave, I’ll drop you a mail later. Look at NPI, ALPI, PDO, EOP, & the works of Zolotova & Ponyavin. I’ll take a look and a think, but I see Jeff Id’s reworking of the land ocean data via the MET supplied perl scripts is looking flatter around then too. 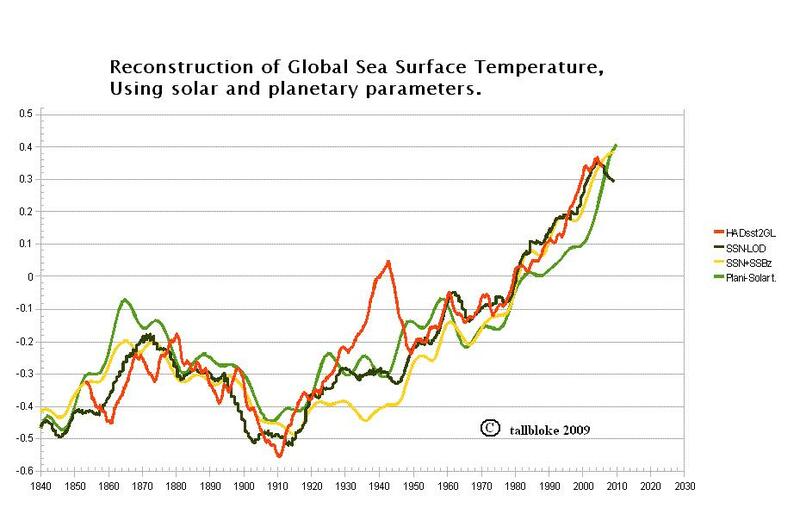 I used the HADsst2GL product for this plot, but in one of the emails leaked out of the CRU, Phil Jones is quite blatant about the 40’s SST’s not being right. I do think there was some considerable el nino activity which my method failed to capture, but unless you can actually offer something for me to look at, I can’t go on a variable treasure hunt right now. I’m in no way convinced that Jones is sufficiently aware of patterns in ’40s EOP. I’d like to convey my insights to you, but I can think of no way to do so succinctly at this stage. I’ll drop notes here & there when I can. It seems you agree that something we might tentatively call an ‘unusual’ oscillation/redistribution caused some kind of a ‘hiccup’ (between basins, if my sense is right, based on my analyses) between the late ’30s & ’50 — I’d be content with such a tentative mutual understanding. I’d provide Barkin links/notes, but since I found *so many articles, I opted to speed-read-for-gist and omit note-taking (which I normally do). I don’t regret the choice because I’m buried in competing pursuits. I do hope someone else will take up the matter of summarizing Barkin, because I have wavelet software to write & wavelet analyses to run (and I’m not convinced that there are a lot of folks in the community equipped to productively work that front, which I consider to be of paramount importance at this stage, since it yields such precise insights into co-phasing [as opposed to co-amplitude] patterns). Maybe someone will volunteer — if so, I’m prepared to provide feedback (as time permits). there is a rapid swing from ~1910 1950, which nicely brackets the mid thirties ‘shift’ we have both noticed from our independent analyses. You may well be right that some of the temperature oscillation of the 40’s is linked to ‘basin shift’ due to changes in Earth Orientation Parameters, somewhat confounded by a shift of which boats were in which basins taking measurements during those years too. Each to their own strengths, and I do appreciate the quality of the stats analysis you have undertaken. I promised to read some Barkin, and haven’t had time. He is still on my list though, through your recommendation. I’m happy for this blog to run at a measured pace, it’s not a gish gallop to get bums on seats. I’m very pleased to have had some great posts from people actually working on this stuff, and I hope it continues at whatever pace suits the contributors. Keep in mind that regional precipitation is spatially correlated over very wide regions. The cumulative sums of NAO & SOI reveal *unique phase-relations of north-south & east-west oscillations in the late ’30s to early ’40s. And remember the ~’20-’40 Arctic warming & Southern Ocean cooling. There’s a lot going on there. I have some ideas…. Forgive my Acronym failure, what is PPT? PPT is short for precipitation in some research fields. (…but that’s by no means exhaustive). Nutation longitude appears to have passed the main north-south axis of NAO around that time. It appears that it should be possible to greatly improve on the work that is being done on links between NAO & polar motion. There is clearly a need for interdisciplinary collaboration. The Earth orientation experts know a lot of physics & differential equations etc., but they appear to have weaknesses analyzing time series to learn more from data. This is actually quite a serious impediment to efficient progress. The pattern to which I’ve linked here can probably be cleaned up substantially – that was a quick ‘back of the envelope’ calculation. I know of at least 5 really simple parameters that I didn’t even bother to optimize, so that already-robust relationship is screaming out something that has somehow gotten overlooked by folks who I would expect should notice it. Hi Paul, you seem to have linked one of your intriguing graphs rather than the article, but there’s plenty to talk about in that anyway. I also found LOD needed to be shifted around four years to get my ‘best fit by eyeball’ (lol, I’m so amatuerish). Your combination of sun to solar-barycentre motion acceleration and the Lunar nodal cycle with polar motion velocity(?) is very interesting. Please tell us a bit more about that. A complex wavelet lets you extract phase. You get x & y wavelet-transforms from which you can construct radius & angle (using a transformation from Cartesian to polar coordinates). The curve is isolated by time-integration of the phase-combination over dominant harmonics. Note that it is not LOD in the graph, but rather the rate of change of LOD (which leads LOD by a quarter-cycle). The lag suggests there is something else to learn about the JN/4 timescale (which is consistent with my findings from time-integrated cross-correlation analyses). It is the magnitude of the year-over-year differences in aa index that underpin the blue curve — time-integration over dominant harmonics isolates the decadal pattern. Correction: Above I should have said there are at least 8 simple parameters (not to be confused with variables) that can be optimized to fine-tune the already-robust fit. Interpretation: Terrestrial oscillations are in resonance with processes at JN, SN, & UN timescales. The QBO signal fits this picture like a glove. For the uninitiated, these initials refer to planetary pairs and the resonances they create via their orbital periods. Jupiter-Neptune, Saturn-Neptune, and Uranus-Neptune. This is fantastic work you have been doing Paul, and I look forward to your summary so I can give it the cohesion it deserves on a separate thread. FYI, I don’t plan to formalize communications until there is funding. Don’t be distracted by the spiky features at interannual timescales when working on the decadal problem – (they can be cleaned up later using nonstationary-period variable-bandwidth moving time-integration). Just difference the curve & repeat-smooth with a simple boxcar-kernel at 11.1-year-bandwidth to achieve a 1/4 cycle shift (corresponding with rate of change of the magnitude of year-over-year differences averaged across Hale cycles) during preliminary analyses to get the gist of decadal dynamics. I drop notes online in case I don’t get funding. I should clarify that while I am not interested in having a post devoted to my work at this time, I don’t regret the effort I’ve invested in dropping some notes in threads here —- your “mixing bowl” is valuable tallbloke, particularly since no time is wasted on inefficient exchanges the way you are moderating comments here. All the best. …so maybe there was a ‘spill’ between the basins via the Arctic (via ocean or atmosphere-teleconnection or whatever – due to whatever circulation pattern disruption or whatever). It’s complicated enough that there’s *plenty* of work here (due to the complexity) to go around for *lots* of researchers. Cheers. Examined the above graph, very interesting. the nominclature is not very clear. I hope the yearly is all correct. You seem to show, from 1910 to 2010, a fairly consistant increase in energy input into the oceans. The solar output is now the lowest measured and the atmosphere is cooling and shrinking/ losing energy. Good summary. If my theory is anywhere near the mark, the ocean retains energy to a much greater extent than currently supposed by the mainstream. Because they can’t believe their own data, they’ve been assuming that some of the ARGO buoys are faulty. No doubt some are, but I think they have probably overcompensated because an ocean losing overall ebergy since 2003 doesn’t fit with their co2 driven climate theory. My understanding from a simple logic point of view, is that the ocean must have shifted energy downwards during the run of high amplitude-short minimum cycles in the late C20th. Now the sun is quiet, some of that energy is rising to the surface again and coming out of the ocean all over the globe. Skeptics are resistant to this idea of stored heat ‘in the pipeline’, but what they need to realise is that it was put there by the sun, not co2! My calculations show that the oceans absorbed energy at an excess rate of around 4W/m^2 between 1993-2003. 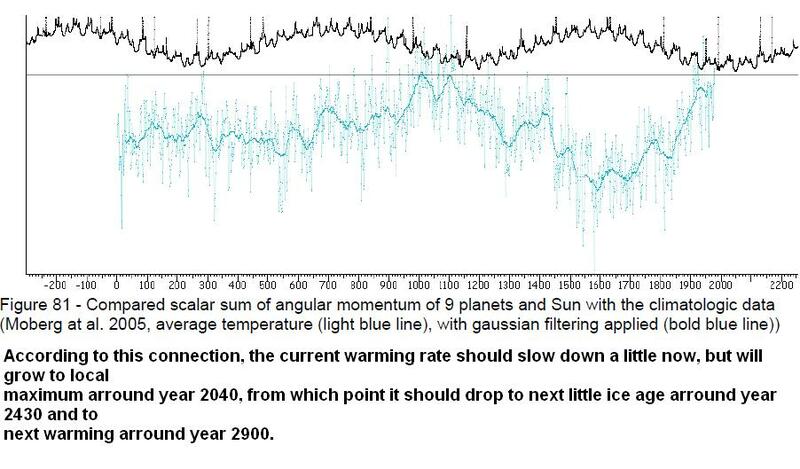 This is far higher than the alleged co2 forcing, and can only be due to less cloud and higher solar activity. But the air as you note, is cooler and less humid, so the heat coming out is not being trapped in by water vapour over the east Pacific like it was in the ’98 el nino, so much of the heat energy is escaping straight to space. This means a loss of energy from the overall Earth climate system and so, colder continental winters, drier, clearer summers, and warm sea surface temperatures until the modoki el nino subsides later this year. I must get around to writing a separate post on my ocean hypothesis. A cooling atmosphere over a warm ocean will be much more cloudy and tend to hold the warmth near the surface. Situation we have now in warm ocean air temperature. One thing I see is that very few people can see beyond a thermometer as an indicator of energy content. The energy storage in the ocean is also in chemical exchanges and the biosphere. The ocean is not just water, it is also a soup of various activities. A giant energy battery. Sorry to make your devinations more complex. Quite right. This is partly why I started looking at other indices of energy input to the Earth climate system. Oceanic biota don’t affect sunspot numbers or planetary orbits. I will take note of your comment when I write my ocean heat content post though. I re-read James Lovelock’s original ‘Gaia: A new look at life on Earth’ book recently, and he has some great insights into chemical and biological processes in the oceans. Well worth a read. It certinly is possiable that changes in sunspot activity does not cause weather changes on Earth. It may well be that the thing that causes changes in sunspot activity also effects Earth weather systems. High sunspot activity, at the same time high hurricane – cyclone activity. Smaller cyclones at mid-latitudes, smaller sunspots at mid-latitudes. Speckles on the sun, thunderstorms on the earth. Sun and earth connected but not directly. High sunspot numbers are the symptom of high solar activity. Would you agree that faster solar wind and the buffeting rapid fluctuations in it bring higher storm activity to the Earth? When you measure the radiant temperature of a simmering pot it’s 212f and if it is boiling briskly 212F. The rapidly boiling pot moves a great deal more energy to it’s surroundings. A faster fluid flow will transfer greater energy amounts then a slower one. Plain old applied science. Higher sunspot activity is indicative of higher EMF activity and therefor greater energy transfer due to better “Q” coupling of the sun earth fields. Electronic engineering. Storms are caused by thermal energy transfer from warm damp atmosphere to cool dry atmosphere, and winds from high pressure to low pressure areas. Energy moving from high to low potential. It has often seemed to me that some spots on the earth spawn pressure cells that are stuck in place for some time before moving off on the trade winds. At times an area that has spawned high pressure cells, spawns low ones, and the jet winds loop around them like water moving around obstructions in a stream. Purhaps gravity or magnetic pumping. Astromachanics ? I just created these word pictures to help think out the answer. I like it, keep it coming. Can your LOD influence also accommodate a 1000 year cycle such as would include MWP, LIA and Modern Maximum ? Hi Stephen! Thanks for dropping by. The LOD data doesn’t go back far enough, but the graph of the solar system angular momentum cycle produced by Semi certainly shows bumps in all the right places. I would second that point of view. The well predictable solar triggers for cyclones, or day to day weather events, are not allways directly associated with sunspot activity. I agree too. It could be that sunspot numbers are just a useful proxy for other electromagnetic phenomena which have terrestrial effects. I would not be at all surprised to find there is signal from the position of the planets in the SSN (likely to be reflected in Earth climate). Also directly seismic events and volcano activity (and hence climate). However, I think Semi is going off on a limb. It’s well known that with enough terms you approximate any series with anything. What he’s doing with is a kind of ad hoc Fourrier series. When you start introducing the smoothed, delayed cosine of the semi angle between Venus and Mars for no objective reason , you’ve lost the plot. Sorry, hardly Kepler. Your LOD + SSN looks quite convincing. Have you posted details anywhere yet? may fit better that frigged hadSST data. Hi P. Solar and thanks for the input. A copy of your monthly ICOADS series with the 0.24C drop through the war years would be most welcome. I’ll plug it into the model and see what we get. The reason I haven’t published details yet is I’m still working on trying to find the algorithm which will work to match and predict the collapses in solar activity which seem to happen every ~180 years +/- 30. Once that is in place in the model I think I’ll be able to generate curves which match cosmogenic isotope records better and provide a more convincing result people will take more notice of. The inner planetary angles seem to relate more to individual solar seismic events such as big flares. Ching Cheh Hung successfully predicted those using a system which included adding a ~30 degree angle to the planetary alignments with the sun as one of the trigger points. This finding seems to add weight to the hypothesis that we are looking at an electromagnetic underlying mechanism rather than gravitational, though both are operative. I just used gnuplot to make the 0.24 adjustment directly when plotting. The formula is trivial enough that you should be able to do , even by hand, if needs be. If you have trouble doing that, email me and I’ll send the data.